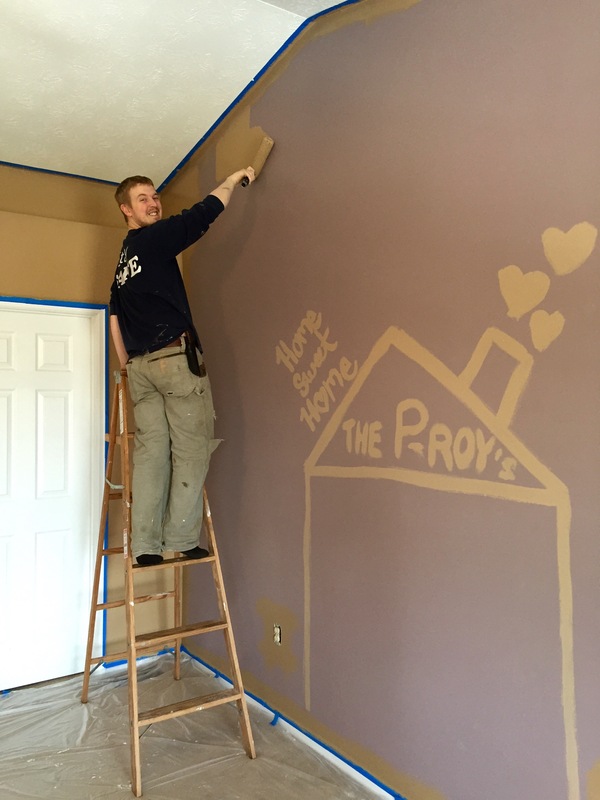 3/7/15 – Day 8: We got a lot done thanks to the super duper helpers we had! 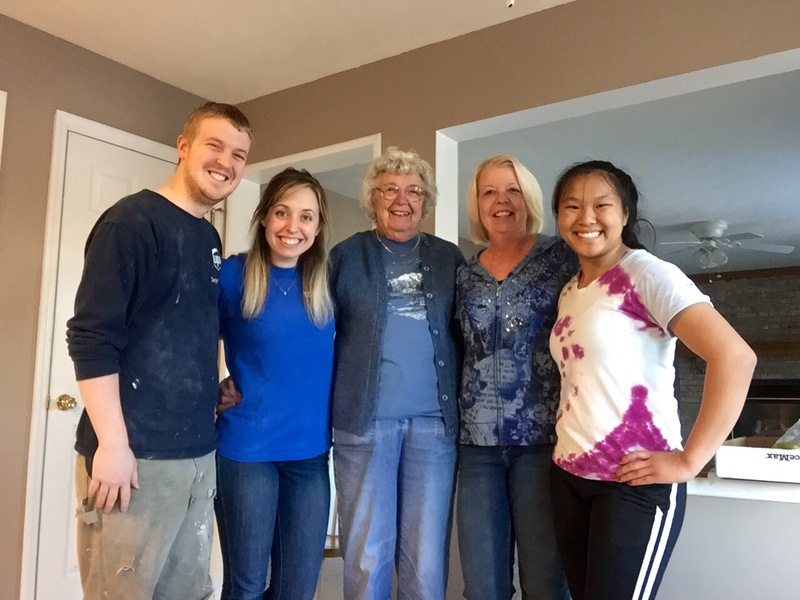 Our MomPom, Gram and sister Carrieli came over and helped us paint the staircase hallway, the vaulted ceiling in our bedroom, tape the upstairs hall bathroom, guest bedroom and strip tape from the rooms where the paint had dried. 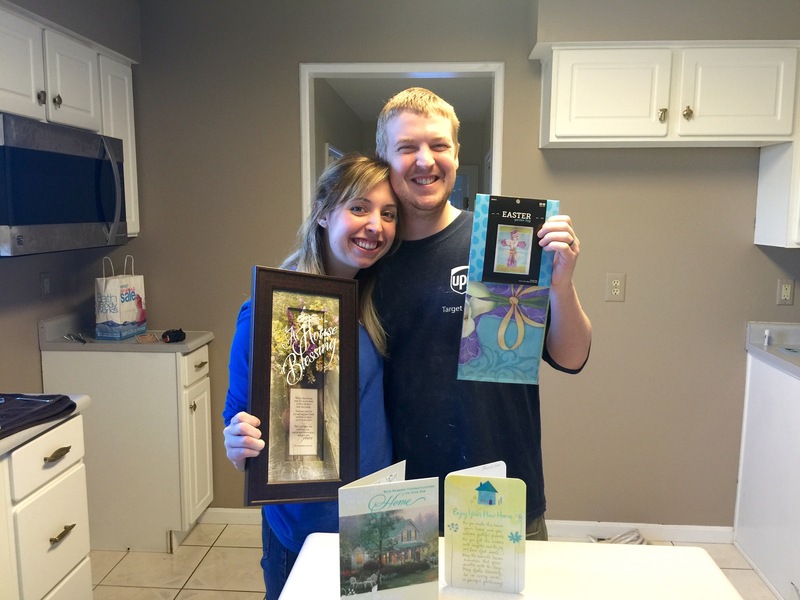 They also brought us some very thoughtful and beautiful house warming gifts and our first home cooked meal in our newer house, a delicious pot of crockpot Chili, one of Matt’s favorites, and Tiger Cake for desert! Even though we didn’t have a table or chairs yet we still had the best time sitting in our breakfast nook with them having our first family dinner together. A couple of the beautiful gifts we have received from our family. Everyone has been super generous with us in giving us sweet, thoughtful gifts to warm our house and make it feel more like home! We can’t wait to put them on the walls to remind us of some of our favorite people in the world. We also finished buying the rest of our appliances and set up the delivery dates for the following week! Since the house was a foreclosure it didn’t come with any appliances which some might say was an inconvenience but we believe on putting a positive spin on all situations and seeing the good in all things. So to us it was a blessing because we got to go buy all new appliances and pick out exactly what we wanted, and since we had been saving for four years and saved a good amount by buying a foreclosure we had the money to do so. Therefore we weren’t worried about financing it! It’s amazing how God pulls everything together, even down to using the amount that we had faithfully put away for such a time as this. 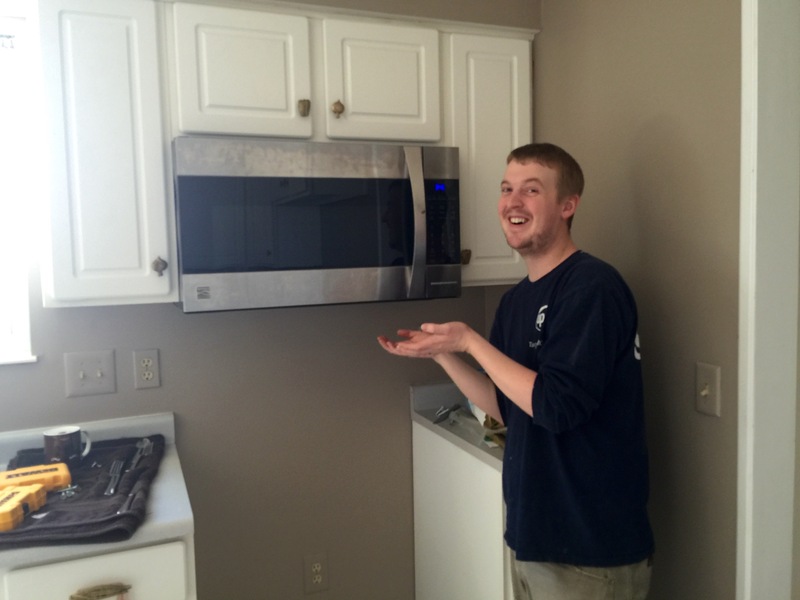 Matt showing off the first of many appliances he installed, our microwave! He seriously saves us so much money by being as handy as he is! 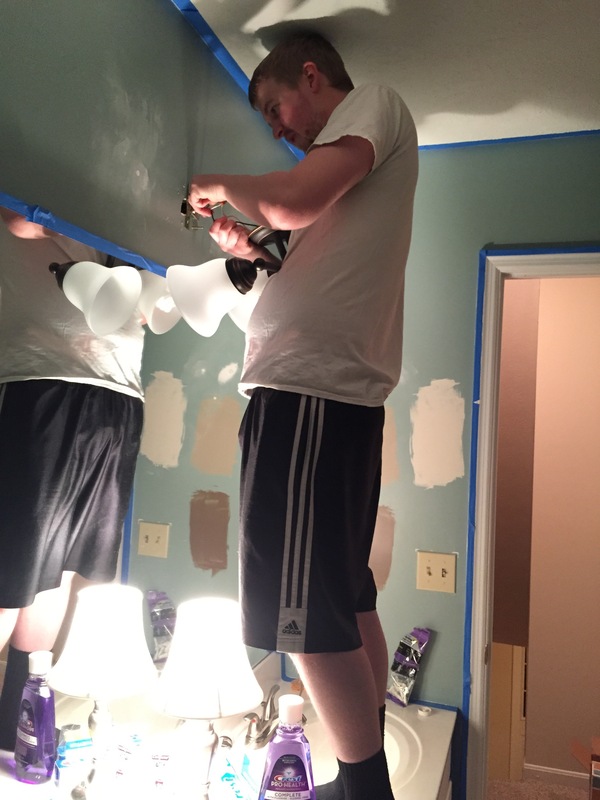 3/8/15 – Day 9: Blair’s Mom, sister Paige and Paige’s boyfriend Ben came over to help us strip wallpaper upstairs in our bathroom and in the 2nd guest bedroom we also started taping our bedroom and prepping it for paint. 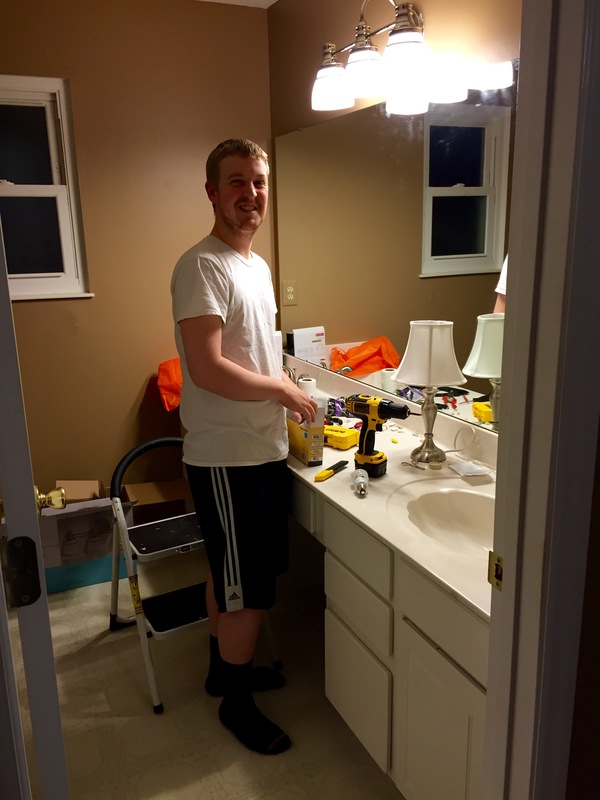 3/9/15 – Day 10: We both had the day off from work so we got up early, grabbed some Chick-A-Fil for breakfast and went over to our house to paint our bedroom and bathroom. Purple is our least favorite color! Therefore we were SO excited to finally get rid of the purple walls in our bedroom!! No offense to those who love the color but just repainting the walls a more down to earthy tone made it feel much more like the haven we call our bedroom and less like a strangers. We also had our dryer and gas stove delivered! 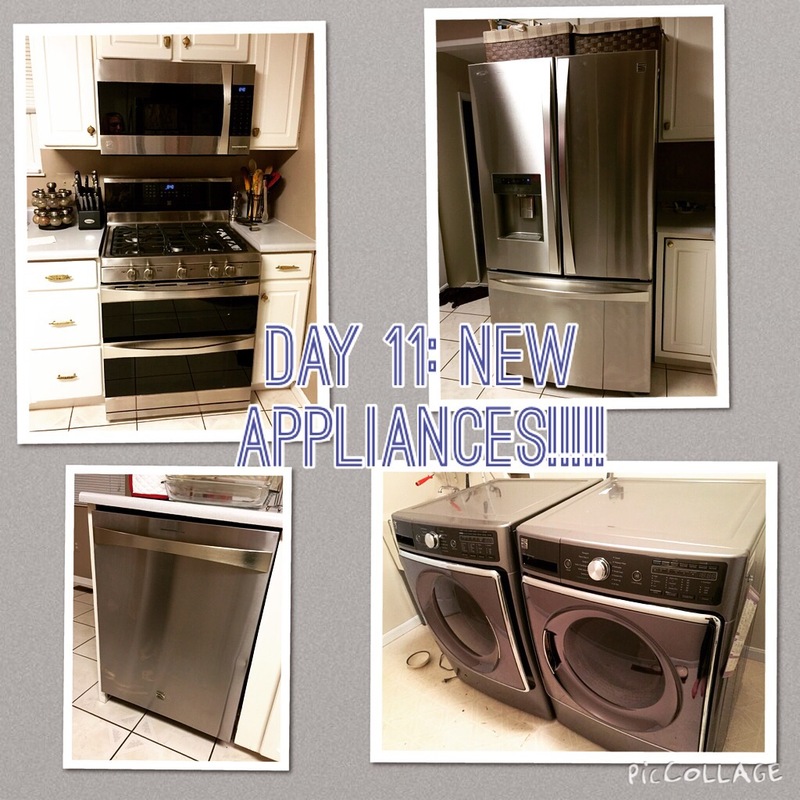 3/10/15 – Day 11: Our washer, dishwasher, and refrigerator were delivered! A little side note, if anyone is looking for new appliances you should definitely check out The Sears Outlet! Not only do they sell all the newest styles but at a fraction of the cost! They also deliver and install up to 5 items for one flat fee! Little side note: Some of you might know this, and some of you might not, but now you all will. 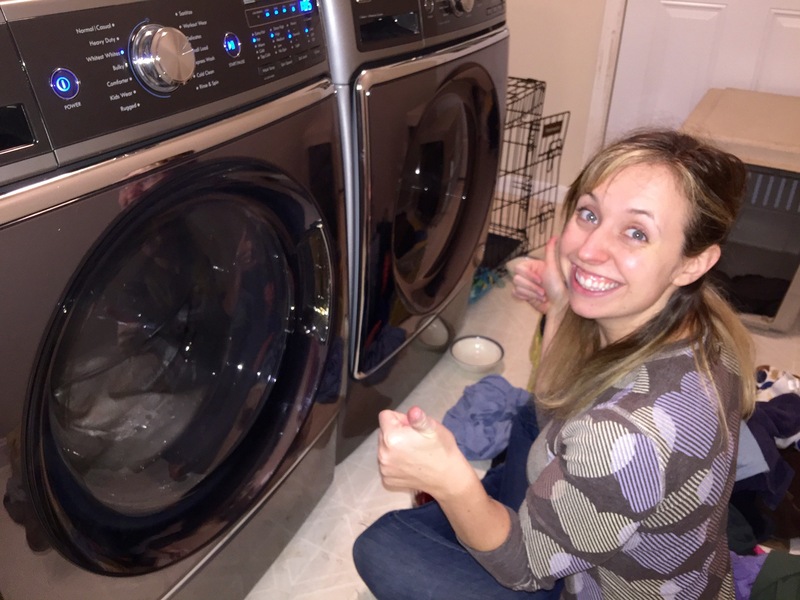 For the past year we have been living without a washer and dryer. The house we were renting sadly didn’t have one because it was so old that the landlords couldn’t fit one into the basement where the hook ups were because the doorways were too narrow. So for the past year every time we wanted to do laundry we had to load up the car and take it somewhere to have it washed. We were fortunate enough though to have a lot of family in the area that offered for us to use their washing machines and dryers so even though we had to take our laundry some where else to do it we never had to pay (unless you count gas money lol) to do it. Needless to say though, we are overjoyed to now have our very own washer and dryer, and can’t wait to pay it forward whenever someone needs to use ours! Matt also installed our dishwasher and fixed a leak under the sink so we didn’t have to call a plumber! Call him Mr. Fix it! 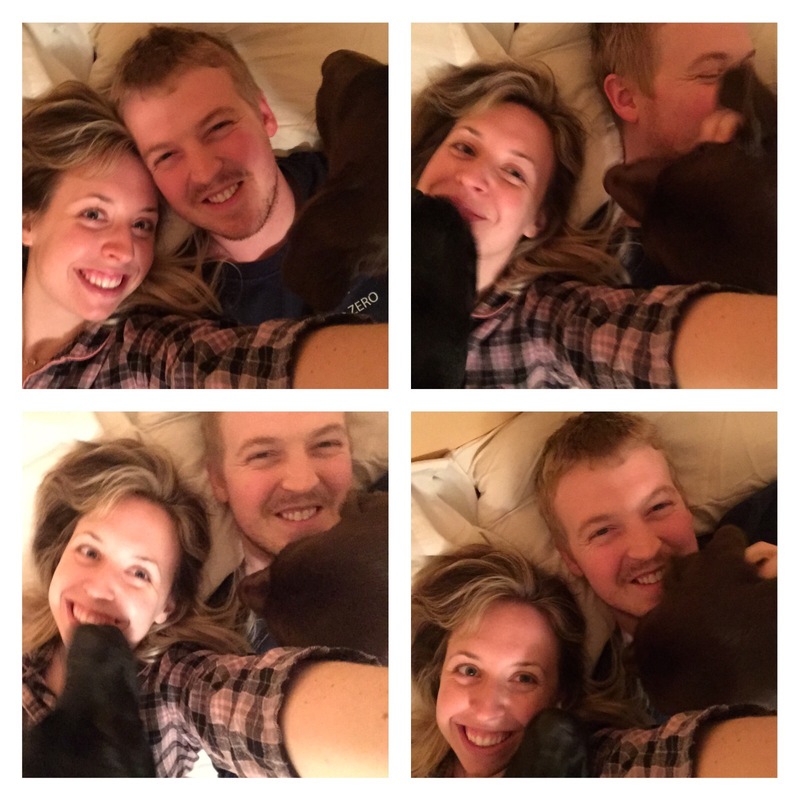 We also brought the doggies over and spent the first night in our house on an air mattress since we now had appliances! 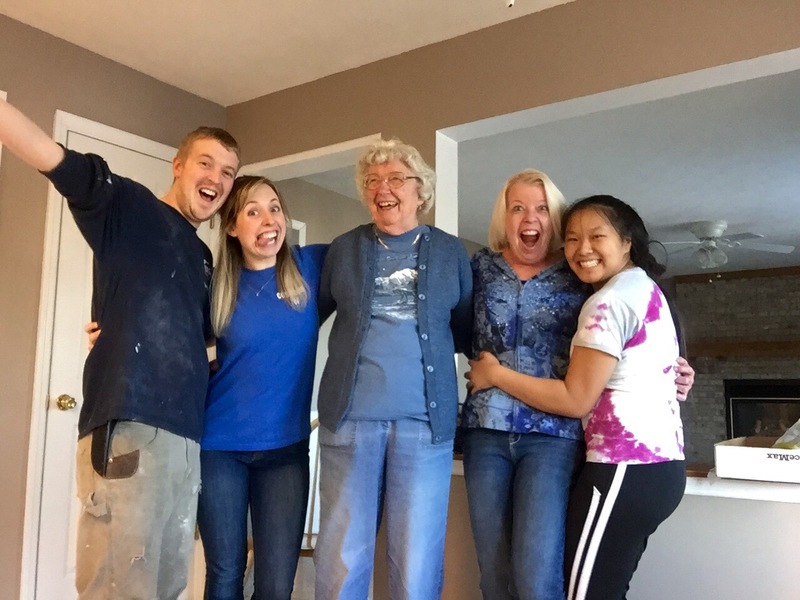 3/11/15 – Day 12: Aunt B came in town and helped us move most of our boxes from the house we were renting in Covington to our house in Florence so that we would only have furniture to move on Saturday. It was a big help having her there and also a lot of fun! We always love spending time with her as well as Uncle Doug and our cousins Emily, Ciara and Savannah, and can’t wait to have them come and stay with us this summer and see all that we’ve been up to in the house!! 3/12/15 – Day 13: Since it was a foreclosure the previous owners decided to take their light fixure’s with them, just like their appliances lol. 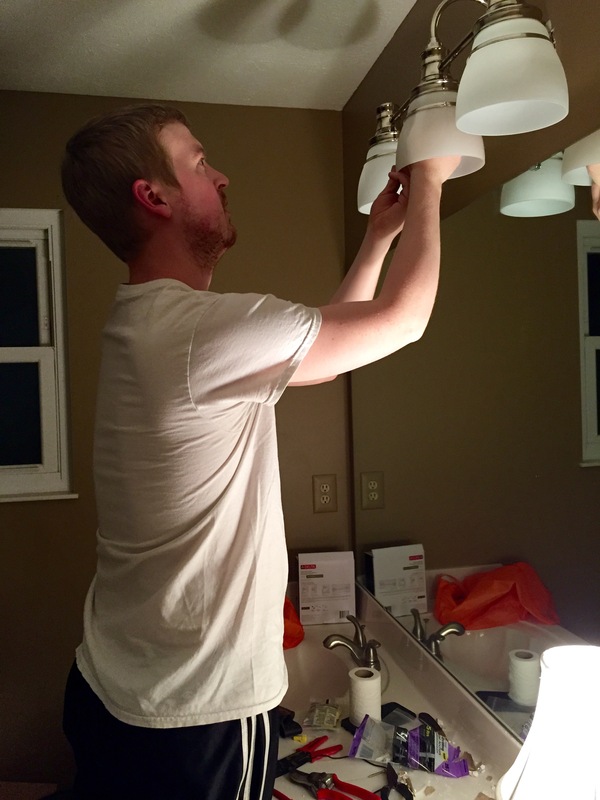 So Matt installed the lights in our bathroom and the upstairs hall bathroom! Again, some people would see this as another downer but we had fun getting to pick out the fixtures we wanted so they would match what we are planning on doing in each bathroom! Matt putting the light in the hall bathroom up! He has seriously skill! I could never do this! So blessed that I married such a handy man! 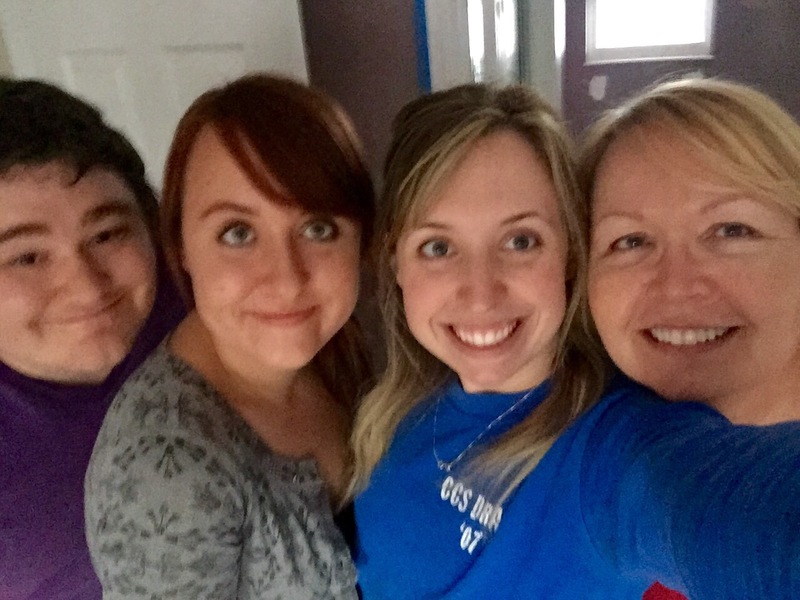 3/13/15 – Day 14: We knew the next day we would have a full day of work ahead of us and we would need to wake up at 6:00 am in order to get the Uhaul by 7:00am for our moving day. So after we both got off work we decided to make it an early night and just move the remainder of the boxes from the Covington house since the next day was moving day! Well there you have it folks! That’s what the second week of our home renovation entailed. Stay tuned to hear all about the fun we had on moving day with the best moving team of friends and family south of the Mason Dixon-Line!